Last week was a great one. 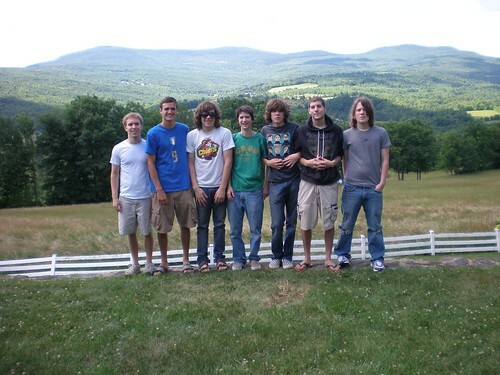 Justin has relatives who own a farm type thing in upstate New York and his band, MHR, went up there to record an album. Being the swell guy that Justin is, he invited Mat, John, Danny, and myself to go with him. The band recorded some great stuff while the rest of us filmed them in preparationto make a documentary about our trip. It'll be out whenever Mat gets around to it... I took an abundance of photos with my digital camera which will be posted on flickr. Mat and Justin also bought a polaroid camera which is perhaps one of the greatest inventions ever. Everything looks awesome and very 70's when photographed with a polaroid. One of the more notable stories from the trip was our voyage to the mall in Albany. Within the first 24 hours we ate all the Oreos and drank all the soda that was provisioned for the week. The 8 of us piled into 2 cars and ventured into town to get lunch and more supplies. We found a dollar store in the mall and so naturally we just had to get some cheap crazy crap. We all bought revolver cap guns and an abundance of caps and 7 of us got canes. I can only imagine what the other people in the mall thought when they saw a gang of totally hot dudes rolling 8 deep walkin' with canes. On the drive home we had shoot outs between the two cars with our cap guns. It is unknown how many cap guns broke within the first few hours after purchase, but it was more than one. Get the * out of your mouth and start thinkin! Mat also painted me a sweet picture. Note to self, I owe him $10 for that. Much thanks to Justin, his mom who made sure we weren't drinking and that the only thing we were high on was life, and his aunt and uncle who let us take over their home.